Extremely soft and highly addictive! 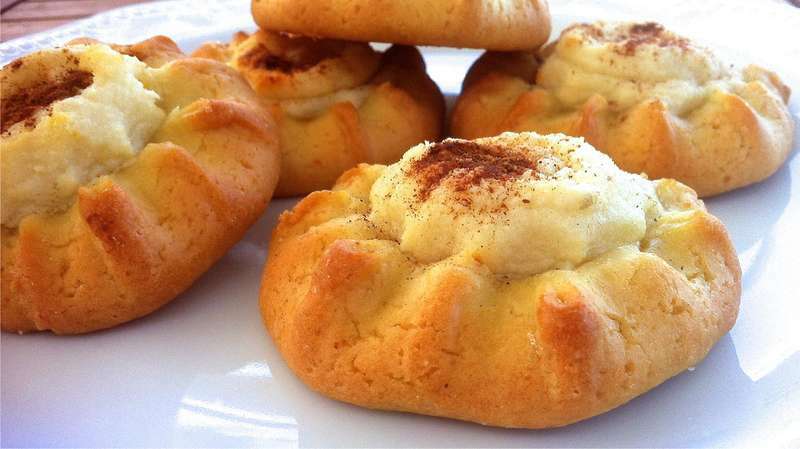 These delicious little cheese pastries are a holiday tradition from the island of Crete, but nowadays they are eaten almost everywhere throughout the year at times of celebration. Kalitsounia are traditionally made with the fresh soft variety of myzithra cheese (not the salty type), but if you can’t find it, try them with some Italian mascarpone or ricotta. Serve as a delicious dessert with a drizzle of warm honey and a sprinkle of powder cinnamon. Enjoy! To prepare the dough for the cheese pastries (kalitsounia), add into a large bowl the olive oil, sugar, yogurt and eggs; blend well, using your hands, until the ingredients combine. Pour in the orange juice, the lemon zest and vanilla extract and blend again. Sieve the flour with the baking powder and add gradually to the mixture. Knead the dough with your hands, until it softens. Depending on the flour, you may need to use a little bit less or more flour than the recipe calls for. The dough should be soft, but not sticky. Leave the dough to rest for about 30 minutes. In the meantime, prepare the filling for the kalitsounia. Mash the cheese into a large bowl, add the sugar, the eggs and the cinnamon; blend well, until the ingredients combine. Add a spoonful of the cheese mixture in the center of each dough circle and spread. Raise the rim of the dough up around the cheese and using your fingers, pinch the edges to pull the dough in around the cheese, leaving the center open, as shown in the picture. Preheat the oven to 180-200C. Place the cheese pastries (kalitsounia) on a large baking tray, lined with parchment paper and leave to rest for 20 minutes. Into a bowl, whisk 1-2 eggs and 1 tbsp of water and brush the pastries. Sprinkle with cinnamon powder and bake for about 25 minutes, until golden. Serve the kalitsounia as a delicious dessert with a drizzle of honey. Enjoy! Hi! I want to prepare this pastry. Is it possible replace strained yougurt with thick sour cream 10% ? Is such replacement will affect to taste or texture of ready pastry?